We researched the best blood pressure monitors out there so you can find the right one for you. Having a reliable, accurate, and easy-to-use blood pressure monitor is vital if you have high blood pressure or even just prehypertension. Below, we detail the best monitors out there so you can find the right one for you. 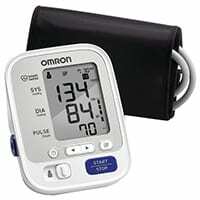 The Omron 10 is far and away the most recommended and well-known blood pressure monitor. 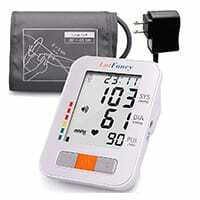 This brand boasts forty years of blood pressure monitor experience, and it shows in the products it offers. The Omron 10 is the company’s latest model and has all the features most patients need. These monitors are well-reviewed by patients. The cuff fits both standard-sized and larger arms, and it’s simple to put on one-handed. The display is easy to read and navigate too. Reading capacity is super important for blood pressure monitors—to determine averages and trends, you need to see a large number of readings. This model offers more than most other brands, and it can track readings for two different users. It will also automatically calculate your average for the last three readings. The Omron 10 uses Bluetooth to wirelessly connect to its app on your smartphone (where it will send your readings to be stored). This makes it convenient for doctor visits and any other time you need to access your readings when you’re on the go. Most people gave the Omron 10 a five-star review, but there a few reports of users experiencing inaccurate readings that are much higher than the blood pressure levels they’ve had on their doctor’s blood pressure machine. With some of the highest reviews of any product on our list, this device from Greater Goods is also the most affordable. The basic model is simple to use and stores sixty readings, which is enough for most people. At less than $30, this blood pressure monitor is one that most can fit into their budget. The majority of reviewers who used this monitor said it worked great and gave accurate blood pressure readings. All the standard features for ease of use can be found on this monitor. Large buttons and an easy-to-read display make monitoring your blood pressure a piece of cake. The Greater Good Blood Pressure Monitor stores only sixty readings. That means you might need to keep a separate log of your readings in order to establish trends and averages. The A&D Premium Monitor is one of only a few models that will work for more than two users. If you and your partner have high blood pressure, and you need to keep readings on other family members, this monitor might be your best bet. With the capability to store sixty readings each for up to four people, this monitor can keep everyone in your family on track. With most monitors, keeping accurate readings for multiple people can be a pain—so it’s nice to see a model that can handle more than two users. A&D’s simple and clear design makes this blood pressure monitor easy for anyone to use. This model has memory storage for only sixty readings for each user. Again, that means you might need to keep a separate blood pressure log to track your readings over time. This monitor is almost $60, which is nearly twice as expensive as most of the models on our list. Given its four-user capacity, though, it may be worth it. LotFancy is one of the only brands we came across that was designed for people who need a larger cuff size. If your cuff doesn’t fit your arm properly, you aren’t getting an accurate reading. People with high blood pressure who had larger arms found this cuff size to be just what they needed to make sure their readings were correct. With a price tag under $30 and the ability to store up to ninety readings for two different users, this machine is a great choice for those needing a larger cuff. This blood pressure monitor gets our vote for best runner-up. One of the models from the most-recommended brand, this monitor has a lot of the same great features as the Omron 10 but comes with a cheaper price tag. Part of the less expensive price means you get very basic features—it only stores up to fifty readings for two users. But if you don’t need wireless technology or hundreds of stored readings, this is a great brand at a great price. This is definitely the blood pressure monitor for the tech-savvy. If you are the type of person who wants a Bluetooth enabled monitor that will work with your smartphone, but you don’t want to pay for a high-priced model, this could be a great option for you. 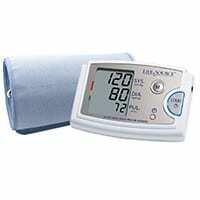 Priced around $30, this lesser-known brand of blood pressure monitor is highly rated by customers. Most reviewers say it’s easy to use and love the Bluetooth and app features. It also stores up to 120 readings for two users. This monitor is the priciest on our list, but it comes with a much bigger cuff than most other brands, so it’s a great option if you need an extra large cuff size. The cuff on LifeSource’s Premium monitor fits arms up to 23.6 inches around (most other cuffs max out at 16 or 17 inches). It stores up to sixty readings for only one user, but this monitor has a majority of good reviews and comes with a five-year warranty. Will my insurance cover my blood pressure monitor? Most health insurance plans do not cover blood pressure monitors. Medicare will most likely not cover the cost of one either. Thankfully, there are plenty of affordable options available through sellers like Amazon. 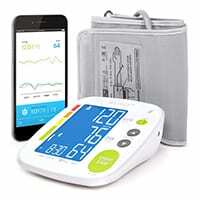 Should I buy a used blood pressure monitor? While there are many used blood pressure monitors available, it’s recommended that you buy a new one. The accuracy and reliability of your blood pressure monitor will determine the course of your hypertension care and may save your life. You want to make sure your machine works correctly. But if you do decide to buy a used one, be sure to take it to your doctor’s office and have it calibrated. 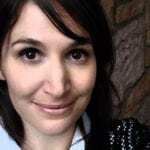 I’m using the DASH diet to control my blood pressure. Do I really need a monitor? The DASH diet (and others like it) are great choices to help manage your blood pressure, especially when done under the supervision of your doctor. But they will not replace the need for a blood pressure monitor because you will still need to take accurate and frequent readings to see if the diet is helping you. I’ve heard a wrist blood pressure monitor may be more comfortable and easy to use. Should I buy one of those? It is generally not recommended to use wrist monitors since they aren’t as accurate as upper arm cuffs. Some patients prefer to use a cuff that sits on the wrist because it’s easier to use one-handed. All of the cuffs we recommended have been tested for one-handed use and are easy to put on. My doctor wants me to get my blood pressure monitor calibrated. What does that mean? Not all blood pressure monitors are the same. Just like any instrument, there are slight differences between the different models. Getting your blood pressure monitor calibrated means you’ll need to take your monitor to your doctor’s office and have them make sure the settings match the monitors in their office. I bought a blood pressure monitor, but the cuff is too small. Can I buy a bigger cuff, or do I need to buy a whole new blood pressure monitor? Most blood pressure monitors come with a one-size-fits-most cuff designed to fit upper arms measuring between 8.7 inches and 13.5 inches. Getting a blood pressure cuff that fits right is critical for accurate readings. If your upper arm measures more than 13.5 inches around, it’s recommended that you get a bigger cuff. These cuffs can be purchased separately and most are compatible with various blood pressure machines. Just make sure your tubing is the correct size to connect with your monitor. My doctor told me I have high blood pressure. Can I use my Fitbit or smartwatch to monitor my blood pressure? While Fitbits and smartwatches are great for keeping track of general fitness data, like steps taken and pulse rate, they are not considered accurate or reliable enough for monitoring high blood pressure. In fact, most heart monitors for exercise will only track your heart rate. They simply can’t take the correct measurements. The only proper way to take your blood pressure involves sitting down for at least a few minutes with both feet flat on the floor and your arm resting at heart level. For more recommendations for proper use, see the American Heart Association’s recommendations for monitoring your blood pressure. To evaluate the blood pressure monitors on our list, we researched recommendations from health care professionals, looked into all the latest models, and read many, many user reviews. Find out more about the SafeWise research and review methodology.